This nice YouTube takeover is pretty much perfect for the movie. Nice work by TVG. Thx, @Grafikspam. It looks like in 2010 we were down on the average number of posts. The actual average has dropped 3 from 27 in 2008 to 24 in 2010. There doesn't seem to be any trends besides the fact 2010 is much slower. Traffic wise though we have been higher than previous years. You have only a couple of days to see it before it melts so get in quick. 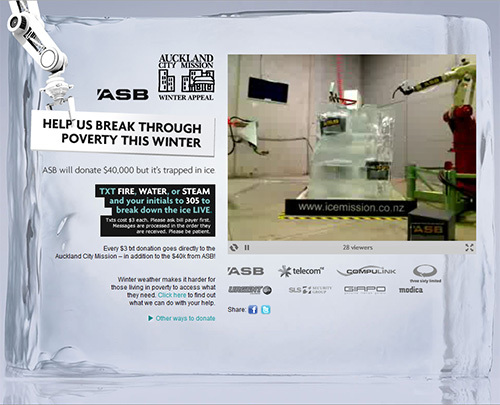 The Ice Mission site asks users to text FIRE, WATER or STEAM to break down a large ice block and help raise money for the Auckland City Mission. It's from Publicis Mojo NZ who have been doing some great work lately. The only downside is when nothing is happening the video is so static and there doesnt seem to be a climax or major payoff at the end. We're seeing more inventive ways to get people to donate. M&C Saatchi's "Throw us a Bone" was another great example of rewarding people who donate and actually making it fun. copy one of the most popular campaigns of the last 12 months and get away with it. It's bad to copy TV shows but the commercials.... yeah lets go with it. Here is the ad in question. You can't get much more of a copy and paste job than this. "It's been said that imitation is the sincerest form of flattery. If so, color me flattered. However, I do have some constructive criticism for the work that I would like to share. It's clear to me that TV3 appreciates great advertising and I'd like to thank them for their efforts. In fact we'd like to help them out and make our ENTIRE LIBRARY OF COMMERCIALS available for them to copy in order to promote their programming. I only ask that TV3 doesn't use our actual footage, but all future homages of this sort are now Kevin Butler sanctioned. You might be asking, "What's in it for you, KB?" Well, I asked that too, and here's what I've come up with: I'd like TV3's support in making the PS3 the OFFICIAL GAME CONSOLE OF NEW ZEALAND. I see this as the only way to make it right with the world. Our super hero team-up could bring the benefits of incredible HD games, Blu-ray movies and the wealth of content available on the PlayStation Network to billions of New Zealanders. Only a total victory in that fine country will satisfy this situation. That, and a box set of Flight of The Conchords sent to the fine creative team in our marketing organization. I await your reply via my Twitter account: @TheKevinButler"
To which @TV3nz responded with: "@TheKevinButler sounds like a fair deal to us Mr Butler!" The issue was raised in an NZ gamer blog Button Masher and then reposted at many other blogs like Kotaku where I saw it. The whole debacle has now fully played out with TV3 pulling the campaign. Gamer Justice is served. While 4chan is feared don't mess with gamers. They are just as organised and scary. As seen by the NZ actor Dai Henwood of the TV3 ad getting attacked on Twitter. Fair go he's just a guy earning paper. Sony's "Kevin Butler It Only Does Everything" campaign by Deutsch would be the talk of the advertising town if Old Spice Man by W+K didn't come into the picture. The two campaigns are actually similar in the fact we have a fake spokesman with fantastic comic timing with a tight script talking at the viewer. Both resulted in increased sales and both created catch phrases that . Oh and I personally love them both. If only Kevin Butler responded to real consumers on Youtube instead of just Twitter and fake consumers. Check out @TheKevinButler & @OldSpice on Twitter and you'll see even more similar tone, probably due to the fact you have just 140 characters to get across the punch line. 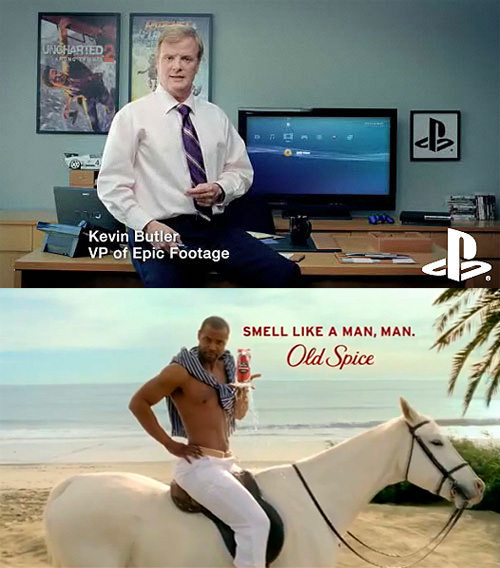 And while the entire world loves Old Spice Man, Gamers love Kevin Butler. As seen here with his cameo at the the Sony E3 keynote. I look forward to many more Old Spice man and Kevin Butler ads in the future and the waft of copy cats to come.